As MoviePass’ parent company – the Nasdaq-listed Helios and Matheson Analytics – has seen the value of its shares nosedive 99.99% in recent months, two Wall Street banks have made millions in fees selling the stock. 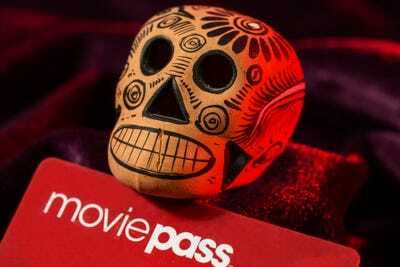 Since last August, when Helios bought MoviePass, a popular movie-theatre subscription service, the company has covered massive losses by selling new shares to the public and diluting previous shareholders. While these banks made millions in commission from Helios, research analysts at the two firms kept “buy” ratings on the stock as it slid, advising clients that Helios was a good deal. Neither ever put a “sell” rating on the stock. Both recently suspended coverage. One retiree investor told Business Insider he used the analyst coverage as part of his decision to pour almost $US190,000 into Helios. His stake is now worth about $US240. In early October, Brian Kinstlinger, a stock analyst at a small New York-based investment bank, Maxim Group, started covering Helios and Matheson Analytics. Helios is the owner of MoviePass, a popular monthly subscription service for movie screenings that effectively makes up all of Helios’ business. He set his price target at $US20, a mark of where he thought the shares could trade in the future. That was a significant bump from $US12.98, where the stock closed that day. “We see numerous ways to monetise a large user base and drive profitability, such as movie promotions, profit sharing, rebates, concessions, data sales and advertising,” Kinstlinger wrote in his note to clients. That much has proved true. 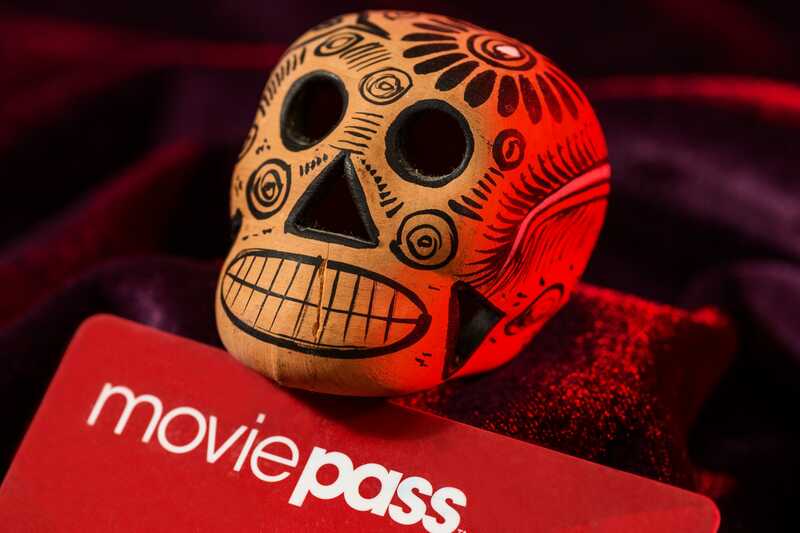 MoviePass last year introduced a business plan in which it stood to lose money on some subscribers who saw as few as one movie a month using its service. In the first three months of this year, Helios lost nearly $US23 million a month. That ramped up to $US40 million in May because of rapid increases in subscriber growth and an estimated $US45 million in June and July, according to Helios’ filings with the Securities and Exchange Commission. Helios has covered the massive losses incurred by the popular movie-theatre subscription service by selling new shares to the public and diluting previous shareholders. While these banks made millions in commissions from Helios, research analysts at the two firms kept “buy” ratings on the stock as it slid, advising clients that Helios was a good deal. Neither ever put a “sell” rating on the stock, even as the share price has cratered 99.99%. Both recently suspended coverage. If you invested $US100,000 in Helios stock on that day in October when Maxim’s Kinstlinger initiated coverage with a “buy,” your shares would now be worth about $US1.85. It’s worth noting that sell ratings are uncommon on Wall Street. The research firm FactSet said last year that only 6% of about 11,000 recommendations on stocks in the S&P 500 were sell (or equivalent), according to The Wall Street Journal. And despite there being a Chinese wall between banking, which handles deals for corporate clients, and research, which caters to investors, it’s common to have banks whose analysts have a rosy view of a business work on an equity deal for that company. “Human nature being what it is, no CEO is likely to throw business to a bank whose analyst is negative on the CEO’s company,” Erik Gordon, a professor at the University of Michigan’s Ross School of Business, told Business Insider. “There are examples of analysts reiterating ‘buy’ ratings 30 days before a company went under,” Gordon said. But banks are unlikely to face consequences for this behaviour unless there is definitive proof they were intentionally misleading clients, Gordon said. According to E-Trade screenshots shared with Business Insider, Ken began to build his stake in March, when the stock was trading at about $US4.50. At the time, both Maxim and Canaccord had buy ratings on the stock, with price targets of $US16 and $US15. Over the next few months, as the analysts kept their buy ratings and high price targets, Ken put almost $US190,000 into Helios, buying hundreds of thousands of shares. Today, that stake is worth about $US240. 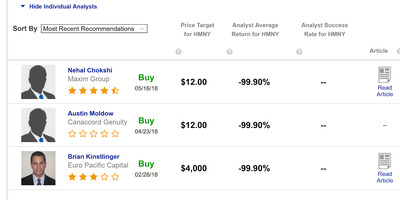 EtradeA screenshot Ken shared showing the analyst recommendations. On February 13, Helios announced in SEC filings that it had sold $US105 million in stock. Maxim had acted as the comanager on the sale, while Canaccord took a more senior role as the sole bookrunner. The banks got commissions and underwriting discounts of $US5.88 million and incurred about $US450,000 in offering expenses. The stock was trading at $US5.43. About a week later, on February 22, the Canaccord analyst Austin Moldow initiated coverage of Helios, putting a buy recommendation on it with a price target of $US15 a share. A few days later, on February 28, Maxim’s Kinstlinger reaffirmed his buy rating with a target price of $US16. Both of those price targets were well above where the stock, which closed that day at $US4.76, was trading. On April 18, Helios filed a prospectus supplement with the SEC to authorise it to sell $US150 million in equity, at-the-market, again using Canaccord, which would be entitled to 5% of gross sales. Helios got off to a quick start selling new shares. On April 19, Canaccord acted as the sole bookrunner on another share sale, with Maxim and Roth Capital Partners serving as comanagers. Helios got $US27.5 million from the sale, while the banks got underwriting discounts and commissions of $US1.66 million, with expenses of $US1.05 million. On April 23, Moldow at Canaccord reiterated his buy rating with a price target of $US12. The stock closed at $US2.46. Kinstlinger changed jobs and moved to another firm, Alliance Global Partners, where he started coverage of Helios on May 8. His advice was again “buy,” with a price target of $US12. 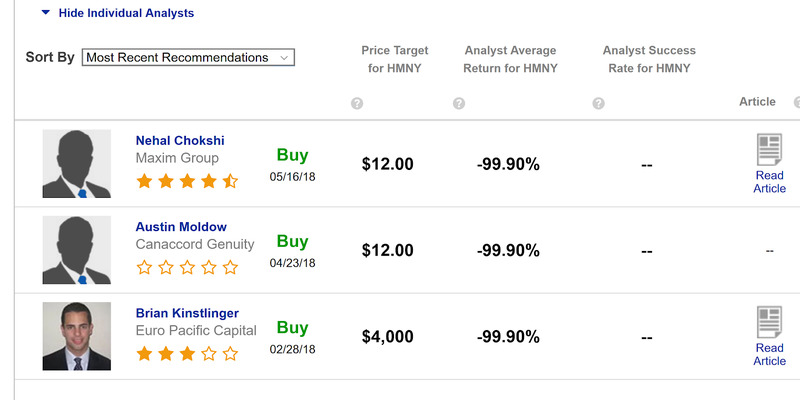 On April 25, another Maxim analyst, Nehal Chokshi, picked up coverage of Helios with a buy rating and a price target of $US12. The stock closed at $US2.51. Chokshi did not respond to a request for comment. The stock plummeted over the weeks that followed, closing at $US0.09 on July 24. After trading ended that day, Helios enacted a 1-for-250 reverse stock split, boosting the share price to $US22.50. When trading started the next day, however, it began to fall again. Maxim put yet another analyst, Allen Klee, on Helios starting July 26. He put a “hold” rating on the stock, the first of its kind from Maxim, with no price target. The stock closed at $US6.83. That’s equal to a price of about $US0.03 before the reverse stock split. Klee declined to comment. On July 27, Canaccord put its recommendation of Helios “under review,” as the stock price closed at $US2. “Given the number of moving parts with Helios … related to the recent reverse stock split, share authorization, capital raises, and operational updates, we are placing our rating and price target under review,” Moldow wrote. Then, on July 31, Maxim suspended coverage of Helios. “We suspend coverage based on new information raising questions about the ability of HMNY to raise enough capital to continue as a going concern,” Klee wrote, noting a $US6.2 million emergency loan the company had to take. The stock closed at $US0.50. It is now trading at about $US0.06.